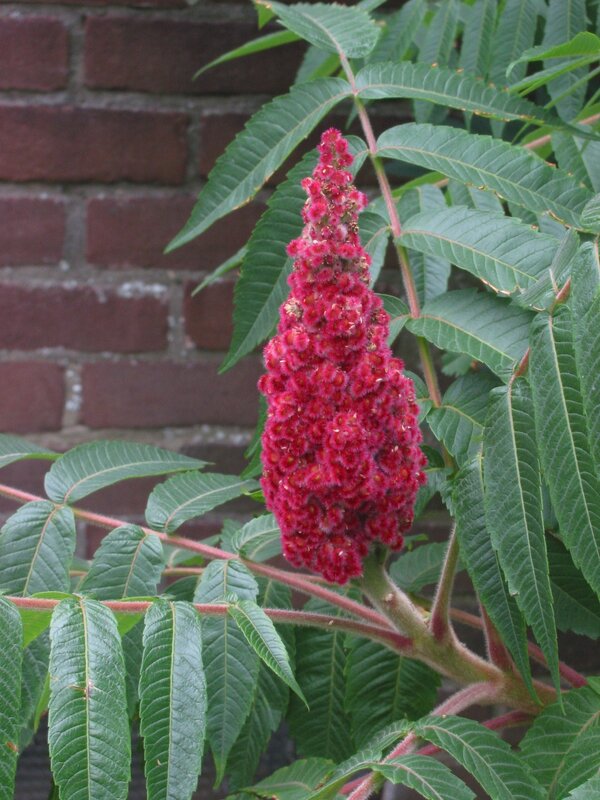 Rhus typhina is a shrub or small tree to 10 m tall, colonial from root sprouts; twigs stout, pith large, yellowish, branches, petioles and leaf midrib very hairy. Leaves pinnate, leaflets toothed, pale below; autumn color red-orange. Flowers tiny, greenish, sexes on separate plants (clones), blooms May-July; inflorescence about 15 cm long. Fruit velvety, red, about 0.2 cm wide, 1-seeded, in a dense, conical head, July-Sept., persistent. Seed load 57%. Pulp nutrients: water 4%, lipid 16%, protein 2%, CHO 3% (White 1989). Available for winter resident birds. Fruit eaten when other food unavailable. Habitat: Open areas, woody pioneer, quickly shaded out by taller plants in developing woodlands. Rocky areas, edges, fill, pH 4.5-7.2 (USDA, NRCS 2010). Tolerant of salt, drought. Intolerant of soil compaction, flooding, shade, index 0-2 (Hightshoe 1988). Notes: Twigs and bark eaten by deer and rabbits (Martin et al 1951). Seed bearing stems have lower rates of vegetative growth than those that do not produce seeds and only stems above a certain size produce fruit in seed-bearing clones. Seed bearing stems also produce more growth of branches than of the main stem (Luken 1987). Clones respond to damage by increased root sprouting (Luken 1990). Not as common on poor soils as R. copallina.